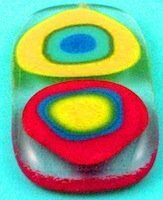 Creating fused glass stacks from multi-colored layers to form an art glass jewelry pendant. To make the pendant the layers are first fully fired and then fired again on a clear base. The layers may be contour fused to retain some of their original shape.A single layer can be used for the base if the entire item is contour fused. This glass fusing tutorial can be altered to suit different sizes and colors as well as using a number of kiln working techniques. System 96 has been used for this project. Step 1. Cut two pieces of clear glass 2 1/2" long x 1 1/4" wide. Cut two 3/4" square, 2 1/2" square and two 1/4" square multi colored pieces for the layers as per the following photo. Step 2. Stack pieces on shelf and place in glass kiln. Step 3. Bring fusing temperature up to about 1460°-1480° F (793°-804° C). Step 4. Fuse layers until fully fired and rounded. Step 5. Switch off and allow to cool to room temperature. Step 6. Assemble stacks a on clear base, place in kiln. Step 7. Bring temperature up to the previous level and fully fuse until the top is nice and smooth with rounded edges. The stacks should be fully melted and rounded. Step 8. Allow kiln to cool to room temperature and then remove item. A large bail can be glued to the rear of the pendant. Subject to the weight and size it may be better to drill and fit a large jump ring. If the item is to be contour fired, do not overheat, the single base glass will distort quickly. Two base layers will retain their shape during contour fusing.